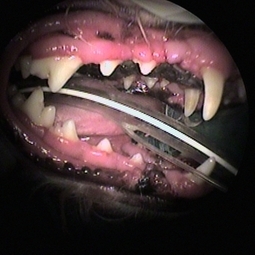 Bad teeth/periodontal disease (bad gums) are two of the most common diseases in the dogs and cats! About 70-80% of our dogs and cats have some form of the diseases and are susceptible to pain, bad breath and tooth loss when neglected. Long term periodontal disease can spread infections to the heart, liver, lungs, and kidneys, where life threatening damage can occur. Proper dental hygiene is as important for your pet as it is for you. Let us work together to allow your pets to live a longer more comfortable time with you. The picture is a post dental cleaning of one of our dog patients.